I suppose I’m a week late to be writing about Aretha Franklin. The pace of news is relentless, and our attention spans are short, so even when the Queen of Soul dies, it’s old business if you don’t hit the topic while folks are viewing golden moments on their social media feeds. But I still have her music noodling in my head. I was a child in the 1960s, when her voice left her father’s church choir and became a national sensation. And in the 70s, when I came of age, the car radio played Led Zeppelin, the Eagles, and—of course—Aretha Franklin. Her songs “Respect” and “Think” are part of the soundtrack of my life. There were two women singing out R-E-S-P-E-C-T. one through the stereo speakers in the living room, and the other in the kitchen while she fixed dinner for her four children before she left for her job waitressing. 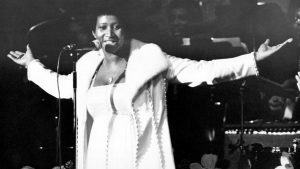 Early on, the pain in Aretha’s life changed her voice and created a beautiful yearning that connected with listeners throughout the world and sold over 75 million records. I doubt my mother knew her story, and how similar it was to her own. She too lost her mother at a young age and, in adulthood, found a wholesome family life elusive. But she instinctively recognized the tenor in Aretha’s music. Maybe it was that Aretha spent her life singing through her redemption. Every key she played on the piano was a note toward healing: hers, my mother’s, and so many others’. The daughter of a Baptist preacher, the Queen of Soul had heard how Jesus uses our sorrows as means for a deeper love. From time to time I have felt it in my preaching; my private struggles gave me a clear message, and the congregation connected. A few years ago, I spoke with a young doctor, fresh out of medical school, who made his career choice after his brother had been killed in a car accident and he had been unable to help him. His tragedy led to a yearning that will heal others. After a recent baptism, a young father told me of his broken home life as child and how it has placed within him a determination to “do better” for his son. So, lately I have been hearing Aretha Franklin’s voice, but it’s my mother I see singing in the kitchen. I am reminded that if we can surround ourselves with the right voices, sorrow can lead to redemption.